Purchased from the artist by the present owner in 1943. H. Pyle, Jack Butler Yeats A Catalogue Raisonné of the Oil Paintings, II, London, 1992, no. 574, p. 526. Dublin, National College of Art, National Loan Exhibition, June-July 1945, no. 127. 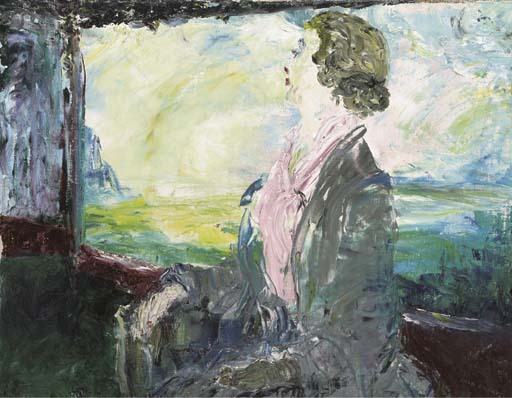 A young woman gazes wistfully through a railway carriage window at the coastal landscape she leaves behind. The mood of nostalgia and reverie is emphasized by the palette of the distant landscape which recedes in a haze of soft tones. Yeats returned to the subject of railway carriages throughout his career. Previous examples include include, The Canal from the Train, 1924 (private collection; H. Pyle, op. cit., no. 223) and The Sky from the Train, 1943 (private collection; H. Pyle, op. cit., no. 547). See also the note to lot 77.